As cities grow bigger, living spaces become smaller. With this, raising a baby in a small space can become a bit of a pain-point for a new parent. 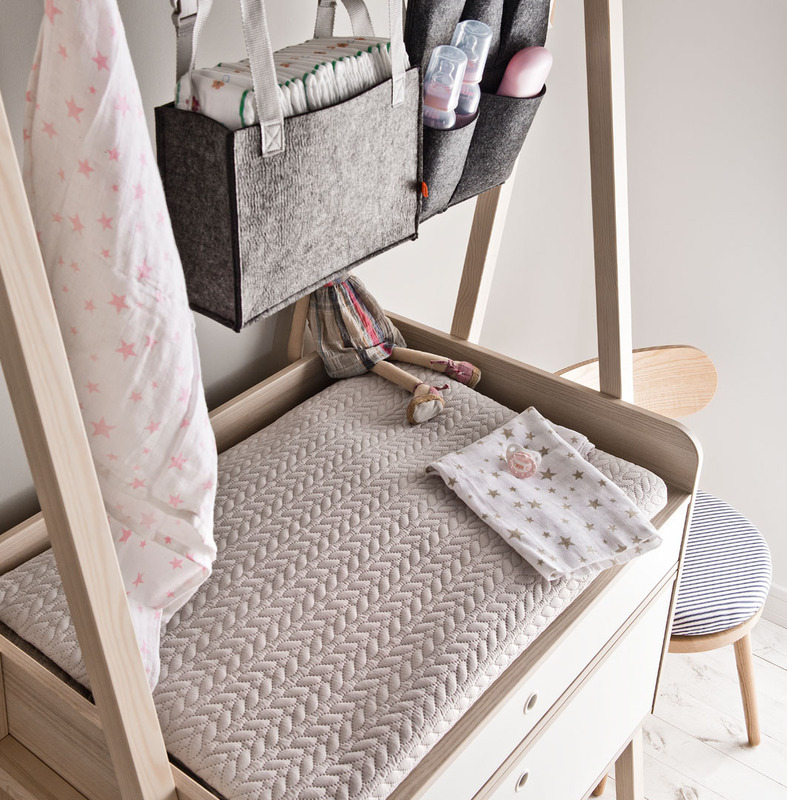 As a new parent, it is best to be prepared and optimise your cosy living space for your newborn’s arrival, without compromising on comfort and the necessities your baby will need. Here are some nifty ways to raise a baby in a small space. Avoid Clutter! Skip Unnecessary Items. The biggest hamper to a small space is clutter. Pack away all toys and items that your baby is not ready to use and keep only the essentials at hand. A nice way of doing this is by making use of storage baskets that are both practical and nice to look at. Get as much shelving in place as possible. Above doors, underneath desks and inside cupboards. Store baby goodies in stylish fabric baskets to add character. Make use of hooks on the inside of closet walls and doors, to hang items for easy storage. Make sure that all out of season items are packed away neatly. Make use of hidden storage that fits underneath your furniture. 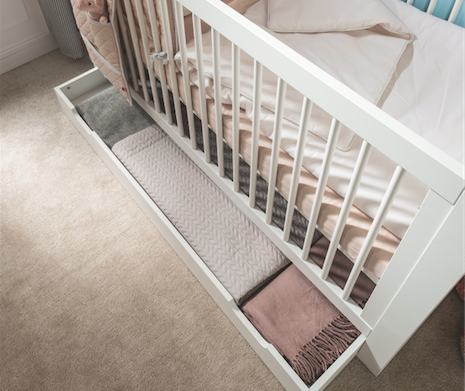 A smart move is to purchase a cot bed with storage drawer underneath to stow away extra baby bedding and other things you may need down the road. Think about what items generate the most mess in your home, and find a centralised space in which to store them. Such as shoes, coats and things that get thrown around the house. Lorena Canals Machine-Washable Tassel Baskets are ideal for storing toys and the Simple Wall Shelf with Hooks can be mounted on any wall for baby necessities. The Flexa Play Display Shelf gives some character and its pastel colours do not overwhelm your space. Baby Items With Multiple Usages. 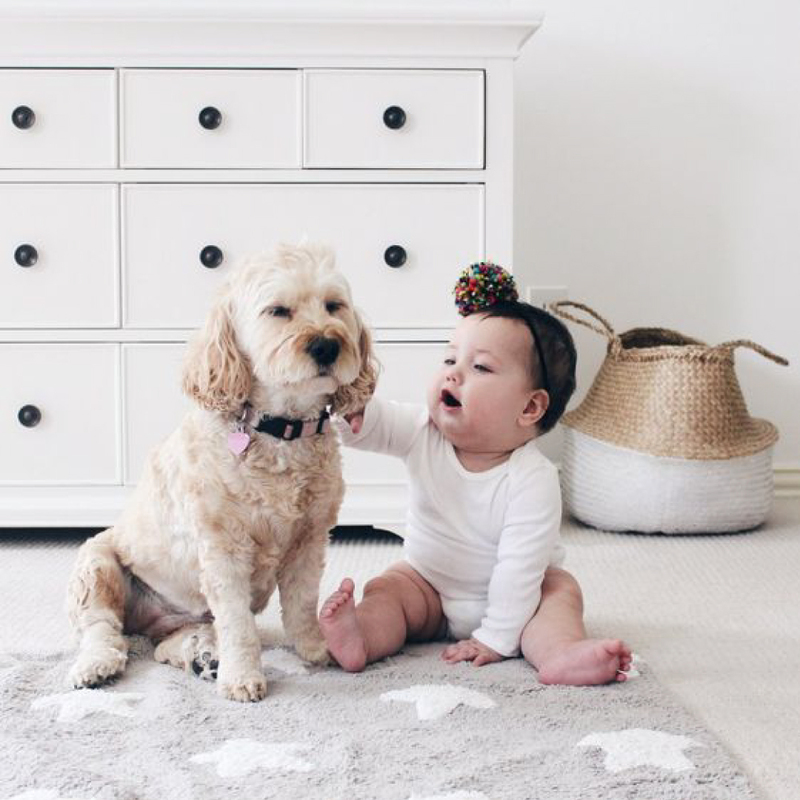 Buy baby furniture items that serve multiple usages, for instance instead of getting just a simple baby seat for feeding times, you can look at getting a multi-functional highchair instead. This will not only help keep your space decluttered by doubling up on its purpose but will help you save by investing in one good piece of furniture that grows with your child. Also choose a compactum dresser combo, to make storage of baby essentials easy and creates an area that is easy for changing. A good quality furniture item of this sort can stay in your home for years, well after your baby has grown out of the diaper phase. The Spot Compactum & Desk can be used for years to come as your baby grows into a toddler and well into their teen years. This furniture item has a timeless clean-lined design. Quality Toys Are The Way Forward. You would want to keep the buildup of toys to a minimum. Go with toys that are of good quality and aesthetically pleasing. Plastic toys tend to break easily so try to go for solid wooden toys. Not only does it look beautiful, but it’s also eco-friendly and good for your baby’s development. Think educational toys that are fun for your baby and help with their educational growth. 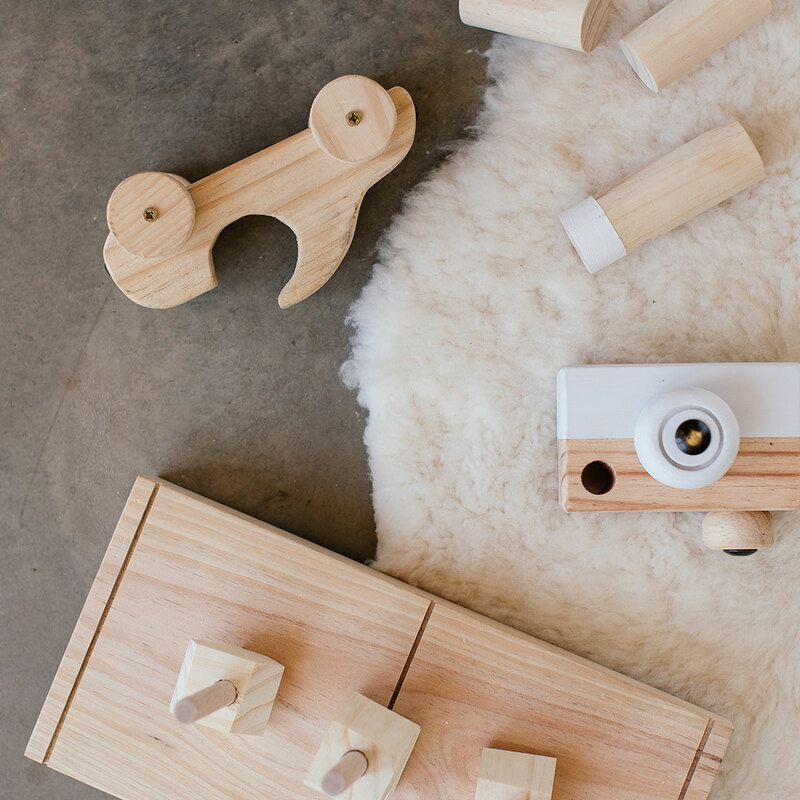 South African designer toy brand, Mumu & Me, offers a selection of beautiful toys for your growing baby made from solid wood. Keep Things Cohesive & Neutral In A Small Space. Brightly coloured toys that accumulate all over a small space can cause it to look as if Joseph and his technicolour raincoat came around one too many a time for a visit. Relieve this headache by choosing neutral tones in the baby items you purchase. Think white crib sheets, white curtains and white changing pad covers to keep things light and cohesive. For baby-bedding go with a neutral pattern that is beautiful and blends in with its surroundings. Compliment neutral bedding with an equally soft, neutral toned machine-washable rug that is warm in winter and cool in summer. Have a look at our Pure White Cot Set that will help to keep things light in your baby’s nursery. For a neutral machine-washable rug, look at the new Lorena Canals Trace Rug in Beige or the Stars Grey & White Rug. Create An Open Space To Play. Re-arrange your living room to create a place where baby and parent alike can have space to breathe and spend quality time together. By creating a reading nook that doubles up as a play area, your living space becomes versatile. 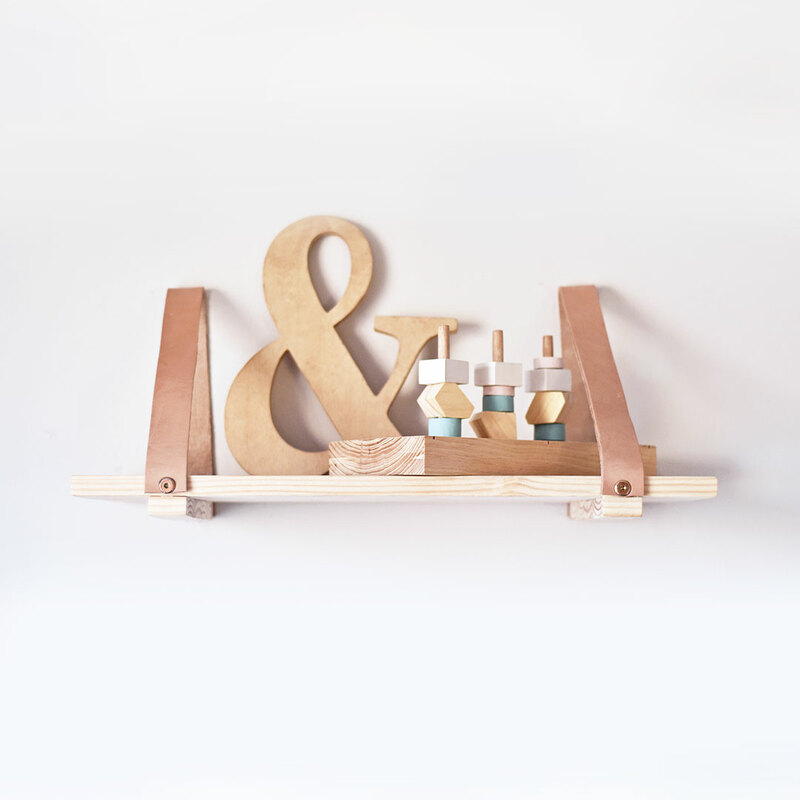 Hang solid wood shelves on your wall to feature favourite items, picture displays and babies wooden toys. Add neutral storage baskets for holding bigger toys. Bring in a modern comfortable rocker chair, for bonding time with your little one, and alone time for you with a good book when needed or add a lush rug with a teepee for little one to play in. The Leather Strap Shelf makes for a beautiful shelving unit. It’s leather straps adds character to your home. Combine this with a couple of neutral belly baskets and a contemporary rocker chair to round off the look. Share with us your own personal nifty ideas on how you have raised your little one in a small space, we’d love to hear from you. Like our Facebook page to keep up to date with new blog posts as they are published, innovative baby and kids products and so much more. Next post: In Search Of A Cot Bed? 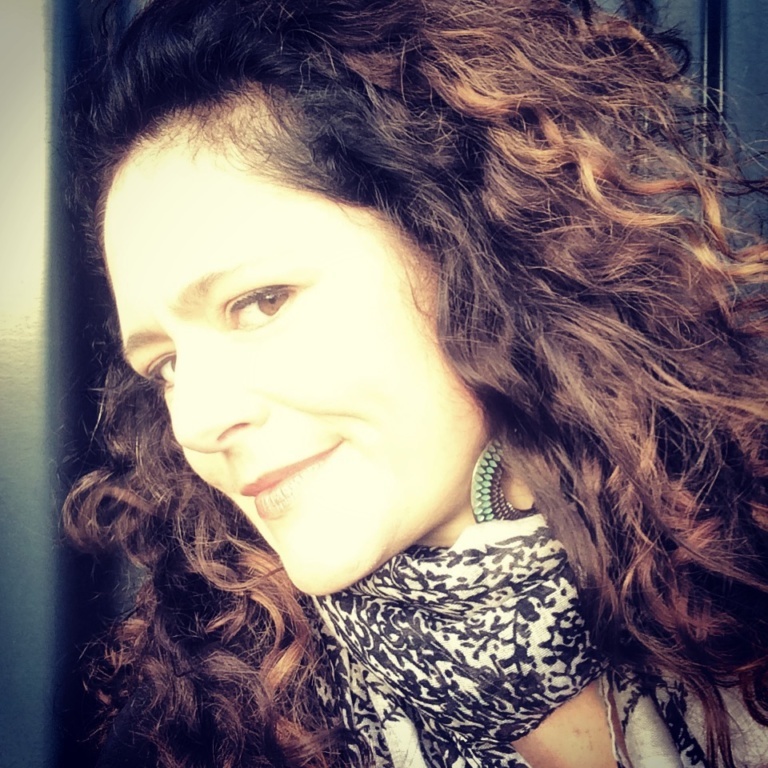 Here Are Five Of The Best.